Margaret “Peg” McFarland of Goffstown, NH, passed away on March 26th, 2019. Peg lived her life with a happy heart and always found the good in every day. She was a devoted wife and mother, providing a steady loving presence for her family. She is survived by her daughter Cathy and husband Alan Exter of Derry, NH, along with her four sons and their spouses, Rick and Lynn McFarland of Deerfield, NH, Joe & Tammy McFarland of Amherst, NH, Dan and Malika of Milford, NH and Phil & Kate of Peterborough, NH. In addition, she had 11 grandchildren and 9 great-grandchildren. Peg was born on April 14, 1929 in Worcester, MA. She was proud of her Scottish heritage, having been raised by her immigrant parents who both worked in factories to support their 4 children. In Worcester, she met her husband of 56 years, the late Earl “Rich” McFarland. Peg and Rich raised their children first in Hollis, NH and then in Amherst, NH, where the family moved when they bought a restaurant, Claire’s Fine Foods. Along with her best friend, Lorraine McShea, Peg cooked and ran all aspects of the businesses while Rich worked in banking and the automobile sales industry. He later owned an auto dealership in Manchester. Peg loved to cook, especially for her family. Holidays were a special event and the McFarland family often made room for orphaned children from Manchester at their Thanksgiving table. Peg employed dozens of young people at her restaurant, many of whom became long time employees. She was ahead of her time in business and even after retirement, remaining up on politics and world events. 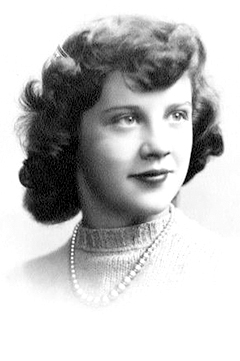 As a homemaker, Peg enjoyed sewing, knitting, and Tuesdays at the beach. Visiting hours are on Thursday, March 28th from 5:00-7:00 pm in the Smith & Heald Funeral Home, 63 Elm Street, Milford. Funeral services will be held on Friday at 10:00 am in the funeral home. Burial will be in North Cemetery, Hollis, NH at a later date. Arrangements are in the care of Smith & Heald Funeral Home, Milford. To share a memory or offer a condolence, please go to www.smith-heald.com.